For the first time in a long time the Big Island of Hawaii has made international news with the recent volcanic eruption. With headlines like “Warning !!! Fast-moving river of lava flows from Hawaii's Kilauea volcano” and “Hawaii volcano eruption sparks GAS EXPLOSION at Halemaumau” it sounds like we’re facing doomsday here on the Big Island, but that couldn’t be further from the truth. Yes, tragically, over 700 people have lost homes and many are in shelters in the district of Puna, but the majority of the Island, including all airports and resort areas, are safe and open for business as usual. All of the Hawaiian islands were created by volcanic eruptions and the majority of the island chains’ volcanoes are dormant. 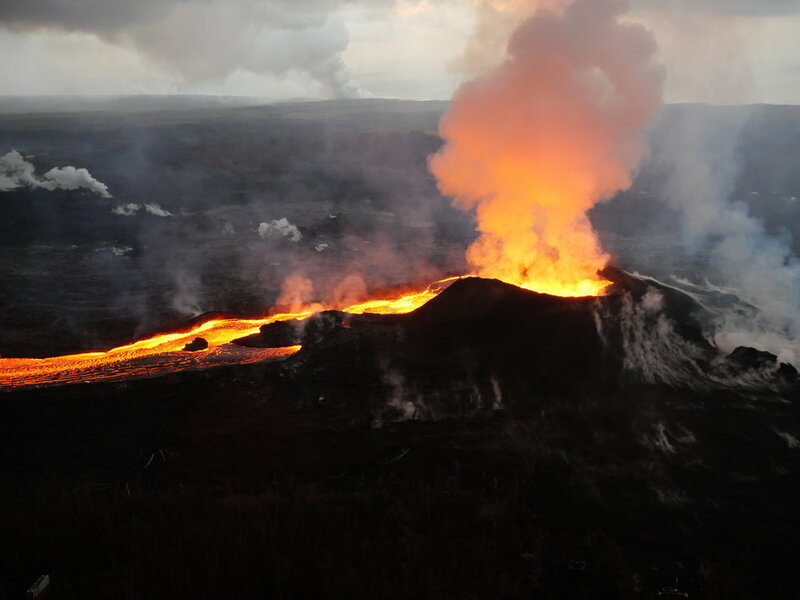 Only the southeastern tip of the island chain has an active volcano, which is named Kilauea. Kilauea has been erupting almost continuously since 1983, but this current stage which began on May 3rd, has been different. The volcano has essentially replumbed itself. The Hawai`i Volcanoes National Park, which has been where the action has been all these decades, has seen the magma source cut off and diverted out onto the flank of the volcano in Lower Puna, 25 miles to the east. As the lava retreated, groundwater has seeped into the hot rocks more than a thousand feet below Halema‘uma‘u Crater, flashing into steam and sending coughing fits of ash into the air from the now-closed Hawaii Volcanoes National Park. Meanwhile, Lower Puna is seeing volcano fissures sending curtains of lava into the air, which is running into the ocean. We’ve all seen on the news what it means for local residents directly affected. But what does it mean for visitors? It means that the park and areas of Puna below Pahoa Town are off limits. You won’t be allowed to get close. If you want to see the lava, you have three choices. Helicopter flights (which have to stay at least 3,000 feet above the ground for safety), lava boat tours (the large amounts of lava entering the ocean are creating an enormous steam cloud that is hiding the lava from viewers for the most part) or you can play a round of golf at Volcano Golf and Country Club which is only 2 miles from the belching crater but upwind during normal trade winds and has a dramatic view of the emissions from the park. The area affected by the current lava flow is in the south east part of the island and makes up a very small portion of the Big Island of Hawaii. Visitors should not be hindered by this activity as it is sequestered to a very small plot of land as it compares the rest of the Big Island. 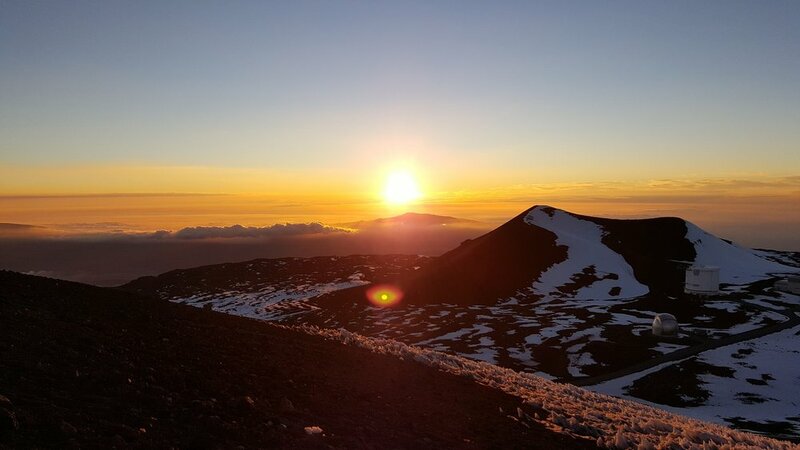 View of the sunset from the top of Mauna Kea, where the lava glow can be seen at night. So, don’t be afraid to come to the Big Island! The people are friendly, you’ll taste some of the greatest (Kona) Coffee in the world and the businesses are open to accommodate your every need and want. I came to Kona Coffee & Tea having worn a multitude of hats throughout my career. Now I'm the Director of Logistics for Kona Coffee & Tea. I spent 15 years in Sports Television, coming into contact with many well-known names but none that left the lasting impression as that of Howard Cosell. Cosell, an attorney turned sports commentator, was also an English major and a grammatical genius. It was from this highly intelligent man that my love of words came to be. Now known as the "Wordsmith" for Kona Coffee & Tea, I edit whatever comes across my desk. I also enjoy representing this AWESOME, Family-owned and operated company.